Synthetic peptide within Human Prion protein PrP aa 200-300 (C terminal). The exact sequence is proprietary. Fetal brain lysate; brain glioma tissue. Our Abpromise guarantee covers the use of ab52604 in the following tested applications. WB 1/5000 - 1/10000. Detects a band of approximately 28 kDa (predicted molecular weight: 28 kDa). Immunohistochemical analysis of brain glioma using ab52604 at a dilution of 1/100-1/250. Overlay histogram showing SH-SY5Y cells stained with ab52604 (red line). The cells were fixed with 4% paraformaldehyde (10 min) and then permeabilized with 0.1% PBS-Tween for 20 min. The cells were then incubated in 1x PBS / 10% normal goat serum / 0.3M glycine to block non-specific protein-protein interactions followed by the antibody (ab52604, 1/100 dilution) for 30 min at 22ºC. The secondary antibody used was DyLight® 488 goat anti-rabbit IgG (H+L) (ab96899) at 1/500 dilution for 30 min at 22ºC. Isotype control antibody (black line) was rabbit IgG (monoclonal) (1µg/1x106 cells) used under the same conditions. Acquisition of >5,000 events was performed. This antibody gave a positive signal in SH-SY5Y cells fixed with 80% methanol (5 min)/permeabilized with 0.1% PBS-Tween for 20 min used under the same conditions. Publishing research using ab52604? Please let us know so that we can cite the reference in this datasheet. Phone call requesting suggestions of antibodies to use with detection of PrP (both PrP C and PrP Sc). For use in Western blotting of mouse and human samples. Would like to detect PrP Sc which is protease resistance. Thank you for contacting us again regarding our antibodies directed against PrP. I am sorry that I was not in the office and able to deal with your call. I am sorry that it has taken some time to find more information relating to the antibodies we currently have to offer and which may be the most suitable for you. We have a number of antibodies which have been confirmed to recognise both the PrPc and PrPsc forms of the protein. These include: ab6664, ab703 and ab14219. I am unsure as to how you are currently performing your experiments but it seems that the normal protocol is to use proteinase K to destroy any PrPc in your sample and then any protein which is left (PrPsc) can be detected using Western blotting. As discussed over the phone, ab703 seems to be appropriate for your experiments, however I am a little concerned that the results that you have been observing have been highly non-specific and the Western blot for this antibody has shown to give quite broad bands. This antibody is covered by the Abpromise and if you do choose to buy it we would offer you all the support we can to make it perform as expected and if you were to be unhappy with the results youmay be entitled to a free of charge replacement or a refund. I would suggest considering ab52604 as this antibody has shown very clean Western blotting bands with human fetal, mouse and ratbrain. I have attached the image to this email. Although this antibody has not been tested to see if both forms of the protein are recognised, it seems likely that it would, using the same procedure of proteinase K treatment. However, as this has not beenconclusivelyconfirmed I would be willing to offer a testing discount to you. This would involve you buying this antibody, testing it with your samples to assess the specificity and once you have shared the results with us through submitting an Abreview of your results (should only take 5-10 minutes) you would be entitled to a primaryantibody of your choice from our catalogue. More information onthis offer can befound here: https://www.abcam.com/collaboratordiscount If you would be interested in this offer please let me know and I can issue you witha discount code. I am still trying togather more informationregarding theotherantibodiesinourcatalogueand will keep youupdated with any furtherrelevant information. I hope this information has been of help.If you require any further information please let me know. Hi thanks for your prompt response. The application is western blotting. the conjugate I am not surebut highly likely is going to be HRP. But your advice on this is welcomed. Thanks for the additional information. 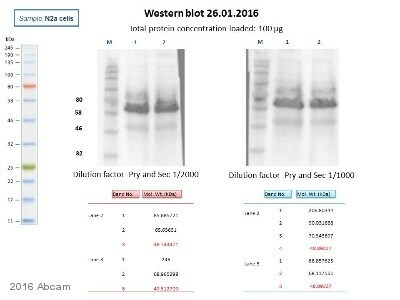 Here is a link to an HRP-conjugated secondary antibody you could for western blotting with ab703: https://www.abcam.com/Rabbit-IgG-secondary-antibody-ab16284.html I hope this is helpful. Please contact me again if you have any further questions. Hello Thanks for your previous advice. Could you please also advice me what is the best secondry antibody to detect primary anti-body ab703. Thank you for your enquiry. I would be happy to help you find a secondary antibody for use with ab703. If you could let me know what application you would use the antibody for and what conjugate you would like attached to the secondary (eg. HRP, biotin, what color fluorophore) then I can recommend a product. Dear Sir/Madam I would like to order your prion like protein (ab753). However, I need a primary antibody to detect it. Can you please confirm that your antibody (ab52604) is able to detect that prion like protein. I look forward to hearing from you. Thank you for contacting us. The immunogen used for ab52604 was a smaller peptide from human Prion protein, whereas the protein ab753 is recombinant bovine Prion protein. Ab52604 was not tested for bovine and is not guaranteed to react; a better choice for use with ab753 is ab703, which used ab753 as the immunogen and will definately detect it. I hope this information is helpful to you. Please do not hesitate to contact us if you need any more advice or information.